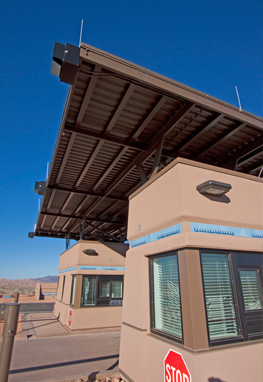 This project involved the construction of a drive-through entrance station to Lake Mead National Recreation area which is located in a remote area of Clark County about 70 miles northeast of Las Vegas. The project involved the construction of a 440 SF main building/ticket booth entrance station and a 40 SF satellite building with shade structures and solar collection systems for supplemental power. Due to its remote location, getting subcontractors and materials to the site in a timely and efficient manner proved to be challenging and required a great deal of planning and organization. The project needed to address the sensitive environmental issues of the site which included the area being home to an endangered species, the Desert Tortoise. Kevcon hired a full-time environmentalist to firstly ensure no tortoises were living in the construction zone. Then, Kevcon secured the site through fencing to ensure no tortoises could enter, and maintained the environmentalist to keep a consistent eye on the site throughout construction. Also, as the construction site was an entrance to Lake Mead, a popular recreational destination, visitors continued to access the park through the construction area as the two-lane, 55 MPH highway remained open and operational while the ticket booths and related construction progressed. This high volume of public traffic prompted Kevcon to remain particularly diligent in their stringent safety protocols which included educating all subcontractors in Kevcon’s Think • Act • Be SAFE safety program and procedures. Scope of work included site preparation, foundations, concrete structure, steel stud walls, steel framing, bullet-resistant doors and windows, interior finishes, equipment installation, plumbing, mechanical, electrical, information and security systems, and photovoltaic systems. The work also included a turn-around area and utility extensions and connections.